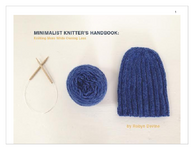 In early 2010, surrounded by yarn I didn’t knit with and needles I never used, I took a stand, declaring myself a minimalist knitter. I did not use or need much of what I had accumulated in the many years of my knitting hobby – in fact, I found the greatest joy from the simplest of tools, the most basic of yarn, and the same patterns used repeatedly to make items for charity and others. Looking to add a unique touch to your wedding? Showcase your crafty side with gorgeous handmade flowers! Love to ski the winter away? This hat will show off your love of the hardest hills, while keeping you warm as you head to the chalet. Unique stitch patterning stretches to fit for several months while working perfectly for both boys and girls. Mock cables give this hat a feminine look while still keeping your head warm through the winter, thanks to the chunky wool yarn. This texture-heavy hat is made from simple knits and purls, making this an ideal hat for a beginner hat-maker. The texture will help keep your ears and head warm, while the slouch keeps the dreaded hat-head at bay! My cable obsession continues with this hat. These cables are spaced far enough apart that they stand out, and this is a perfect hat for beginner cablers to test the waters with! All-over texture makes the slouchy Falan Hat a fun knit for experienced knitters, while the construction is simple enough for a beginner hat maker, all while the slouch makes it perfect for winter weather. The Hadley Hat will help you use up worsted weight yarn scraps in a flash! Simple construction, endless color combinations, and a slightly slouchy fit suits just about everyone! The Halloweenie Beanie is the perfect little hat for October! Made with a wide variety of babies and children in mind, this is the perfect hat to make for hospital donations, the kids in your child’s play group, or all the littles in your family! The Hanscom Park Pixie will stretch to fit a wide variety of baby heads, making it one of the more versatile hats in a newborn’s wardrobe. Just a few rows of ribbing ensure this hat will stay put, while the stockinette body gives you space to work stripes and patterns if you so desire! Perfect for using up leftover bits of super bulky, The Jefferson Hat features tiny hearts scattered across a super warm and snuggly wool background … plus a pom for the perfect finish. Who doesn’t love a pom?! The Keiran Blanket is a soft and squishy blanket, perfect for newborn photo shoots and for use as a car seat snuggler. The pattern knits up using super bulky yarn and straight needles, although you can substitute three strands of worsted weight yarn if you prefer. A fun alternating rib pattern adds interest to this warm wool hat, perfect for winters around the globe! Named and modeled after the amazing Maggie of Gussy Sews, this cowl comes with two different size options (a more fitted cowl, as seen above, and a looser version), perfect for any size neck and any desired width! Please say a sweet welcome to Merrymeeting Mitts! The Midtown Ribbed Pixie will stretch to fit a wide variety of baby heads, making it one of the more versatile hats in a newborn’s wardrobe. All-over ribbing and long ties under the chin help keep this hat in place while keeping little ears warm. While knitting my way through a bunch of yarn for a Raverly group, I realized I was leaving half-skeins of yarn left and right, unused in my knitting basket. I’ve been trying to knit through a skein before I start a next one, and so having all these half-skeins laying about was starting to bother me. I love a ribbed brim on a beanie, to be sure, it’s good to branch out! The Naomi Hat features a garter stitch brim, knit on smaller needles, perfect for folks wanting something a bit different, while still keeping a classic look. In celebration of reaching the halfway point for my One Hundred Hats challenge, I wrote up this quick hat pattern. Here in Omaha, we refer to our city as “The Big O” and our city symbol is a giant red letter O. It was a no-brainer for me to turn this symbol into a pattern that could represent our city with pride! The third in the Six Simple Hats For Fall, the Chunky Slouch Hat is a quick one to get started and finished, uses worsted weight yarn and large needles, and works for both men or women. I’ve knit it up with chunky yarn and even thicker needles, but am in love with the look of it with worsted best. A simple stockinette stitch, broken up by purl ridges creates a ribbed and slouchy hat. Purke is the young pitcher for the TCU Horned Frogs, and his wonderful story inspired me while watching him pitch his team to the semi-finals in their first-ever trip to the College World Series! Because I was at a baseball game I needed to make a simpler pattern, and as I knit and he pitched, this hat was born! While watching football with my brother over Thanksgiving, we were laughing at the newest NFL skull caps that had been handed out. While with some team colors they looked horrid, at best they looked like the top color was “raining down” into the lower color. And a Rain Down Hat was born! Red Velvet is a hat that can be worn by men or women throughout the year. The hat features cables that cover the hat from brim through the decreases, and looks good in wool or acrylics. Perfect for donation, the Refuge Hat uses HDC throughout to create a thick and comfy texture that will keep your head warm in any conditions. Simple and easy to knit, the Sandoval Hat can be made with or without a folded brim, using just about any worsted weight yarn you have on-hand, and looks great either solid or striped! Add this one to your list of essential patterns - the Shauna Cowl is the perfect addition to your winter knitting! A few months ago I was introduced to Ashely at The Shine Project through another blog. I was instantly blown away - what an amazing woman who is doing amazing things! With all the cables and baubles and stripes that have been adorning my hats as of late, I was craving something simple and easy - knit knit knit all the way around was in order! This slouchy beanie is perfect for first-time knitters. Basic techniques make it a quick knit for all skill levels, and the modern style makes it the perfect gift! With fall comes football and showing off your team spirit! As the weather turns chilly, this reversible hat will take you from home games to road games to tailgating in style! The Tiny Hearts Hat is the perfect introduction to stranded color work. You only work the second color every other row, you don’t decrease with both colors (instead using only the main color), and the hat can be made for boys and girls, men and women! This adorable pixie features an open-weave texture perfect for spring and summer babies. This super easy baby blanket can be crocheted up in a matter of days, and the size can be adjusted to fit anyone from the smallest of preemie to the largest of adult! While watching the Winter Olympics in February, I noticed the hats the American commentators were wearing looked hand-knit. Modeled after those hats, this hat is knit with a large ribbed band, stockinette to the unisex decreases, and is turned inside out so the backside of the stockinette stitch is shown when worn. All over braided cables are a perfect introduction to cabling both in front and in back, making a hat that’s perfect for both men and women.